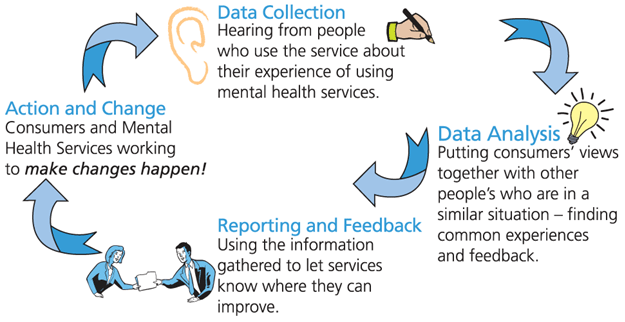 The Mental Health Consumer Perception and Experiences of Services (MH-CoPES) Framework is a process for all NSW public adult mental health services to involve consumers in improving their services. The MH-CoPES Framework assists consumers to evaluate their services and to use this evaluation for consumers to work together with services and improve them. Consumers evaluate their services using an MH-CoPES Questionnaire. Information from Questionnaires is collated and analysed to produce reports every six months. Reports feed back to consumers and services around strengths and areas needing improvement. Consumers and services use reports to work together to make changes and improve their services for everyone. The four steps make up one complete evaluation cycle and the cycle is repeated. The MH-CoPES Framework is underpinned by a set of 9 interconnecting principles. These principles have provided the foundation for development of the MH-CoPES Framework. The MH-CoPES principles are the guiding philosophy behind consumer evaluation and participation in quality improvement through the MH-CoPES Framework. The MH-CoPES Principles can be found here. The MH-CoPES Framework holds a numberof benefits for consumers, services and staff. To learn more about these benefits click here. identify improvements and/or additional support needed for implementation.